Nathaniel Lewis took home a $5,000 grant at last night's event to bring a massive toy cap gun installation to the Grand Rapids Art Museum (GRAM) this fall. PHOENIX (Arizona) MAY 23, 2018 – ArtPrize, the independently organized art competition heralded as the world’s largest annual public art event, in collaboration with FOUND:RE Hotel, last night awarded a $5,000 grant to Nathaniel Lewis for his Pitch Night Phoenix-winning entry, ‘Re:VOLVER.’ Lewis captured the attention of last night’s five judges, earning the opportunity to realize his vision at the Grand Rapids Art Museum (GRAM) in Grand Rapids, Michigan during ArtPrize 10 – slated to take place from September 19-October 7, 2018. Pitch Night Phoenix is presented by 21c Museum Hotels and Delta Air Lines, and underwritten by Experience Grand Rapids. Lewis’s work was selected from among five artists who presented their ideas for ambitious installation projects at last night’s Pitch Night event. Each artist had five minutes to explain their proposed installation to a panel of arts professionals including Sara Cochran, former director and chief curator of Scottsdale Museum of Contemporary Art (SMoCA); Rebecca Rothman, director of public art at City of Tempe; Patty Haberman, chief curator at Mesa Contemporary Arts Museum; Julio Cesar Morales, curator at Arizona State University (ASU) Art Museum; and Jennifer Wcisel, curatorial assistant at the Grand Rapids Art Museum. 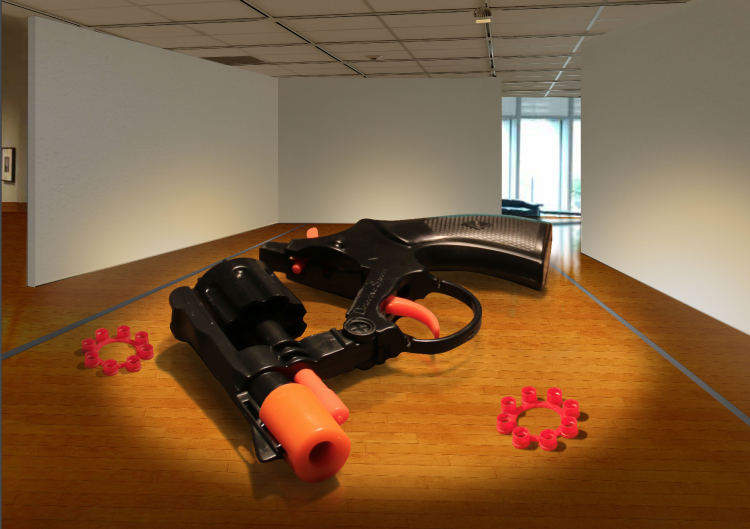 Lewis’s massive replica of a child’s toy gun is informed by the artist's concern for the specter of gun violence in America, and the way toys are used to rehearse future behaviors. The cap gun replica will be placed on the floor of a gallery in the GRAM, stretching 13 feet in length. To complement the piece, giant plastic cap rings will be strategically placed on the ground nearby. ArtPrize Pitch Night launched in 2013 as a means of discovering and supporting ambitious, exciting projects and to reduce the barriers to bringing them to the annual competition. Since its inception, the Pitch Night program has continued to expand and in 2018 includes events in six cities across the country. Following last night’s event, 21c Museum Hotels will host the next two Pitch Night events -- in Nashville, TN on May 24 and in Cincinnati, OH on May 29. Bank Suey will host the final Pitch Night event on May 31 in Detroit, MI. Each event will award the winning artist $5,000 and a spot in a prominent ArtPrize venue during the tenth annual event. ArtPrize 10 will take place across downtown Grand Rapids, Michigan from September 19-October 7, 2018. Artist registration for the world’s largest art competition is underway and will remain open through June 7.